1) It is not an armadillo: It is a pangolin, a wolf, or a dragon. 2) An armadillo may have floated up to Europe before 1460. 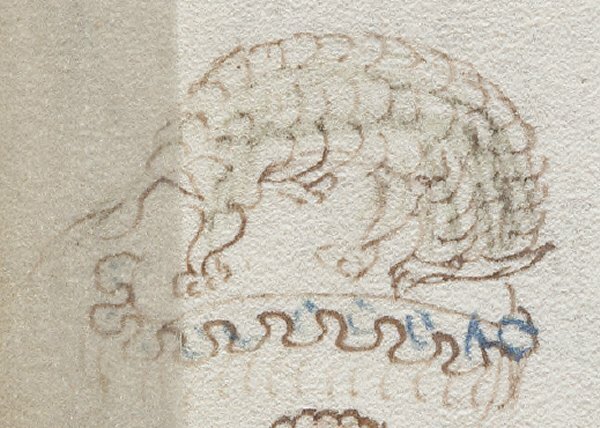 3) It looks too much like an armadillo to be one, because the Voynich is never accurate in depictions. Contrasting with this is feedback from those who did not care a bit about the date of the Voynich… including a group of people who knew nothing of the Voynich, and were presented the image by an interested party… the feedback was overwhelmingly “it’s an armadillo”. The remainder were a couple of pangolin and one wolf identifications. What does this mean? Of course, a million people can think it is an armadillo, and that will not make it one. So it is not the numbers alone which intrigued me. What did strike me was that the majority of those who thought this could not be an armadillo were the same people who believe the Voynich was pre-Columbian. This strongly implies that the “expert opinion” of Voynich dating is colored by it’s own prejudices and projections, and should be taken with some reservation. The armadillo fascinated Europeans. It was an iconic representation of the mysteries of the New World and it’s inhabitants, much as the sunflower was. And the sunflower is one of the most recognized Voynich flowers… of course, it is not an exactly perfect representation of a sunflower. But like the armadillo, the sunflower would date the Voynich to post-1492. Ironically, the sunflower has been critisized for looking too little like one, to be one. So in these illustrations, if they are what I believe they are, an armadillo and sunflowers, it implies that the Voynich was created post 1492, and more likely, mid- to latter sixteenth century (as their images were not prevalent before then) at the earliest, and with New World influences and associations. This would fit my theory, as I believe it was created 1610 to 1620, and might be expected to have New World influence, as the (fictional) inhabitants of (fictional) Bensalem were transplanted Native Americans. I have a page, linked here, of armadillo types, and armadillo references, descriptions, and earliest representations.